The research group of Associate Professor Nobuyuki Shiina of the National Institute for Basic Biology have revealed that the function of RNG105 (aka Caprin1) is essential for the formation of long-term memory. RNG105 is a factor involved in protein synthesis in the vicinity of synapses, which transmit information between neurons. Mice who have lost RNG105 in the cerebrum and hippocampus can form short-term memories of several minutes, but the research group has shown that long-term memory, developed over several days to one week, does not form in these mice. 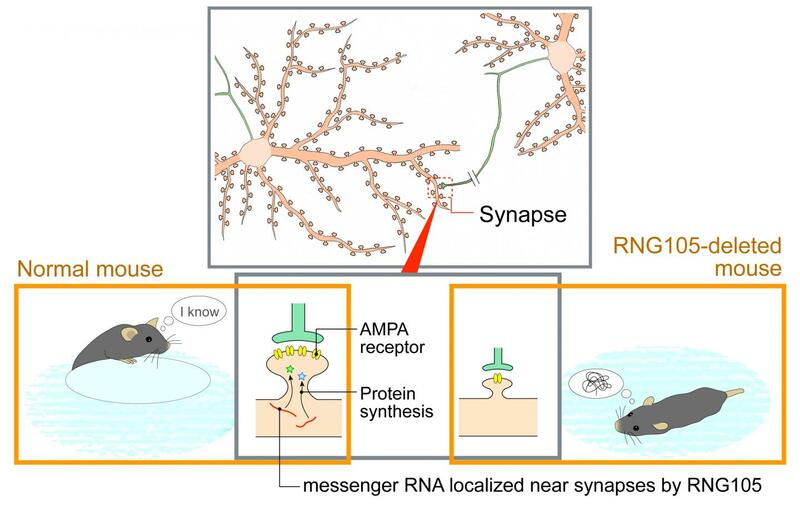 Also, when long-term memory is formed, it is important that the synaptic structure between neurons enlarges and new neural circuitry for memory is retained (called synaptic potentiation), in mice lacking RNG105 however the group found that synaptic potentiation is not sustained. They also found that RNG105-regulated protein synthesis is involved in the correct placement of AMPA receptors in synapses, which are known to be important for memory retention. Dr. Shiina has said, "This new finding has advanced our understanding of long-term memory and paved the way for applied research towards improving long-term memory in human diseases." The results of this research were published in 'eLife' on November 21st, 2017.